Wow - these photos are murky! They weren't murky in my photo! The quilt colors are much prettier in person! Saturday I put the blocks together, after much moving them, rearranging, etc. The corners of the rings were too white so by adding quick corners of color (blue and lavender), it reduced the WHITE, and added to the pattern. Unfortunately, somehow, those fairy dickens moved some of the blocks around and 2 were sewn WRONG! Dang it!!! By morning, I had renewed energy and determination to unsew and resew them in the proper location. This is the cutest fabric! There is leftover for the back also. It's directional, and after much stressing, I made the pattern more around the quilt (cut on the length of fabric). The top and bottom were already too wide to use just one piece on the width. Stress over! Hey, it took courage to CUT through all those sweet little fairies! In this dry climate, many people are not familiar with the term " fairy rings" In moist climates, frequently in lawns, you see a circle of grass that has grown differently from the regular lawn. Or, you see a circle of mushrooms that presumably the fairies use as sitting stools, or umbrellas. The growth pattern has something to do with spores. Fairies and elves get confused, and sometimes fairies are good, other times evil. (Hey, I checked Wikipedia!) This quilt is going to a moist climate. It's big - about 68 inches square to a 3 1/2 yr. old great niece, who asked for "Fairies" and "Girly". I have several rings that include a melon/orangey fabric that glows in the dark - looking (to me) like lightning bugs. I'll get to quilting it soon. What a great and imaginative quilt. Fabulous! She will love it. What little girl wouldn't want this quilt. 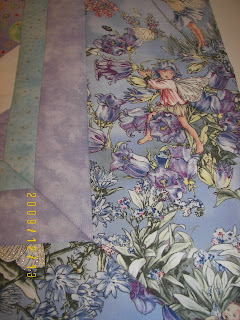 Love the fairy fabrics and the beautiful soft center blocks. 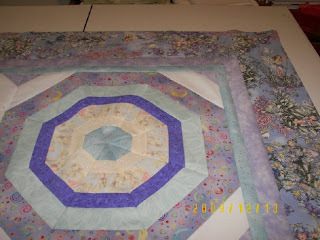 The little girl that receives this quilt is going to love your quilt- so very pretty. Beautiful. She's going to love it! You do such beautiful work. When you said: "Hey, it took courage to CUT through all those sweet little fairies!" I giggled a bit and thought to myself "I bet it did!" I admire your determination. You expressed that with the last QOV you did as well. I'm starting to see that in you on a regular basis. That's you then. Yep. A determined quilter. I dig that about you!!! I've seen this fabric and it is lovely. Your idea of "fairy rings" is great. I'm sure that your niece will cherish this one for many years! blended, think blended! And yes, she'll love it! Just lovely. It looks like water rings in a pond! 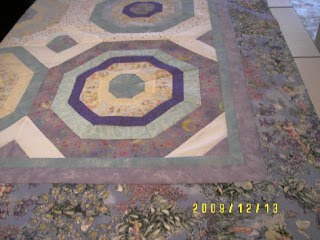 What an adorable quilt, Elaine!! I love flower faires, and I love that block you have done and I also love that swirlie purplie/blue print with the different colors. It is beautiful!